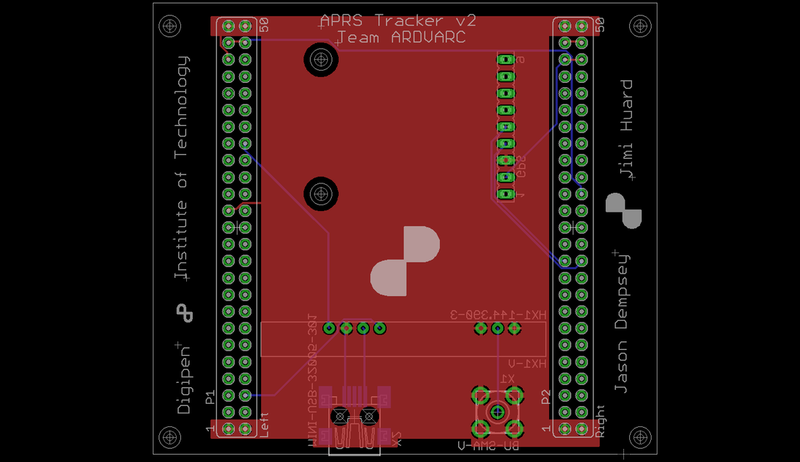 Project GARI is an APRS tracking device for use on scientific balloon platforms. It has been successfully field tested, allowing for the recovery of a balloon in Moses Lake, Washington. The team (starting from semester 2) consisted of Johnny Sim, Jason Dempsey, and myself. Johnny did an excellent job of documenting the majority of the project, which can be found on his website at johnnysim.net. After Johnny graduated, the second APRS PCB board, featured to the right, was fabricated and prepared for launch. This time, it was tested in the University of Washington's temperature chambers, where the solder joints proved to survive in varying temperatures from -40 degrees Celsius to +60 degrees Celsius. The tests proved very successful with the new board, as packets were received throughout the entire process. A few more drive tests were performed, and the final launch at Moses Lake International Airport in Moses Lake, Washington was a success. Packets were received with a near zero error rate, and the payload was discovered within 100 meters of the final packet's reported position. The on board camera remained intact, allowing video to be recovered.